Gina Haspel is sworn in as the new U.S. CIA director as Secretary of State Mike Pompeo holds the bible and President Donald Trump looks on during ceremonies at the headquarters of the Central Intelligence Agency in Langley, Virginia, May 21, 2018. Gina Haspel, a 30-year veteran of the U.S. Central Intelligence Agency, was sworn in Monday as the spy agency's first female director. 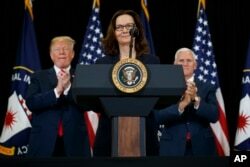 President Donald Trump watched as Vice President Mike Pence swore in the 61-year-old Haspel during a ceremony at the CIA headquarters, outside Washington. ​"Gina is tough, she is strong and when it comes to defending America, Gina will never back down," Trump said. "The men and women of this agency deserve exceptional leadership and that is what they are getting." Trump called her "a very special person ... someone who has served this country with extraordinary skill and devotion." He said "there is no one in this country better qualified for this extraordinary office than you." She is replacing Mike Pompeo, who recently became U.S. secretary of state and stood nearby as Haspel, his deputy at the CIA, took the oath of office. Haspel described her life at CIA and that of other U.S. intelligence workers as "more than a career," but rather "a calling" to protect the country against terrorist attacks. President Donald Trump and Vice President Mike Pence applaud incoming Central Intelligence Agency director Gina Haspel during a swearing-in ceremony at CIA headquarters in Langley, Va., May 21, 2018. "We are the best and our challenge is always to be the best," she told CIA workers in the agency's lobby. The U.S. Senate confirmed Haspel last Thursday by a vote of 54-45, ending a tumultuous nomination process in which lawmakers revisited the CIA's past interrogation practices. Six Democrats voted in favor of Haspel, while two Republicans opposed her nomination to replace Pompeo, who was confirmed last month as the country's top diplomat. Senate Majority Leader Mitch McConnell, a Kentucky Republican, praised Haspel, a career CIA employee, as "uniquely qualified to face America's biggest national security challenges," adding that she has "earned the respect and admiration of the men and women of the CIA." Trump's selection of Haspel sparked controversy, given her oversight of harsh detainee interrogations after the 9/11 terrorist attacks on America. She also wrote a memo authorizing the spy agency's destruction of videotapes showing what many legal scholars said was the torture of terror suspects. Democrat Patrick Leahy of Vermont announced his opposition to Haspel shortly before the vote, calling some of her known record "disturbing." "I do not question Ms. Haspel's commitment to our national security. But I do question her fidelity to a core value of our nation — that all people have certain inalienable rights," Leahy said in a statement, adding that the basic dignity of human beings "is incompatible with inhumane practices like torture." During her confirmation hearing, Haspel repeatedly declined to say whether harsh interrogation techniques were morally wrong. Earlier last week, however, she wrote a letter to the committee's top Democrat, Mark Warner of Virginia, saying the CIA should not have conducted abusive interrogations. "As Director of the CIA, Gina Haspel will be the first operations officer in more than five decades to lead the Agency," Warner said in a statement. "I believe she is someone who can and will stand up to the President if ordered to do something illegal or immoral like a return to torture." VOA's Mike Bowman and Jeff Seldin contributed to this report.